What makes a pizza great? A crust that is chewy yet crisp, a piquant sauce, plentiful fresh mozzarella that is oh so gooey, spicy sausage. Finish the pie with a little basil, a drizzle of olive oil, and a sprinkle of sea salt and I’m in heaven. The pizza I described isn’t quintessentially Italian, nor it is American. I’ve yet to find it in a restaurant. It is the pizza of my dreams. My fantasy pizza is a result of my travels. It’s a combination of everything I love about a Napolitano pizza and that of New York-style one (with a little Chicago excess for good measure). It amazes me how each region affects the recipe. In Rome, you can order pizza by weight. There are many different versions of that type of pizza—some without sauce, some with zucchini blossoms—but the hallmark of all of them is a hearty, focaccia-like crust. But in Rome you can also get a circular pie, which you’re expected to eat as a personal pizza—even though it’s as big as your head. This pizza is in the Napolitano style with a thin crust (slightly darkened from getting close to the fire in a brick oven), a light layer of sauce, and a little bit of mozzarella with perhaps a sprig of basil. The simplicity of the Margherita highlights each ingredient. Availability of goods makes a product differ from place to place too. In Chicago, their meat-packing heritage continues and you can find pizzas layered with some of the finest sausage you will eat. Some people swear that the water in New York makes its pizza crusts perfect. It might, because their crusts are pretty spectacular. In Italy, you can find mozzarella that is hand-crafted using curds produced by cows that have grazed off the land from grasses where no pesticide has been used. Italian farmers generally rely on more traditional methods before GMOs, pesticides, and hormones. I’m torn between two worlds, Italy and the States. I love the simplicity of Italian pizza with its reliance on a few ingredients at their prime, but it doesn’t go far enough for it to be my dream pizza. It lacks the panache of an American pizza. Not that I want all the excessiveness of some American pies, just a little more “oomph” some days. Over a century ago, Italians came in droves to the U.S.—some opening up restaurants. Faced with different availability of goods, as well as dining rooms filled with a melting pot of palates, Italian restaurateurs created a new cuisine, Italian-American. Today, due to globalization and greater product availability, we see many American chefs revising Italian-American cuisine by using foods like wine, olive oil, cheese, and pasta from places such as Emilia Romagna, Tuscany, and Campania. Additionally, we’re seeing more chefs focus on traditional concepts like slow food and farm to table. Very soon my fantasy pizza may be in reach. Or…since this is America, I’ll just be able to customize it. This family, originating from Italy, has been serving Italian food in various restaurants for decades. After moving back to Michigan, Alberto Gulino opened the pizzeria in 2016. 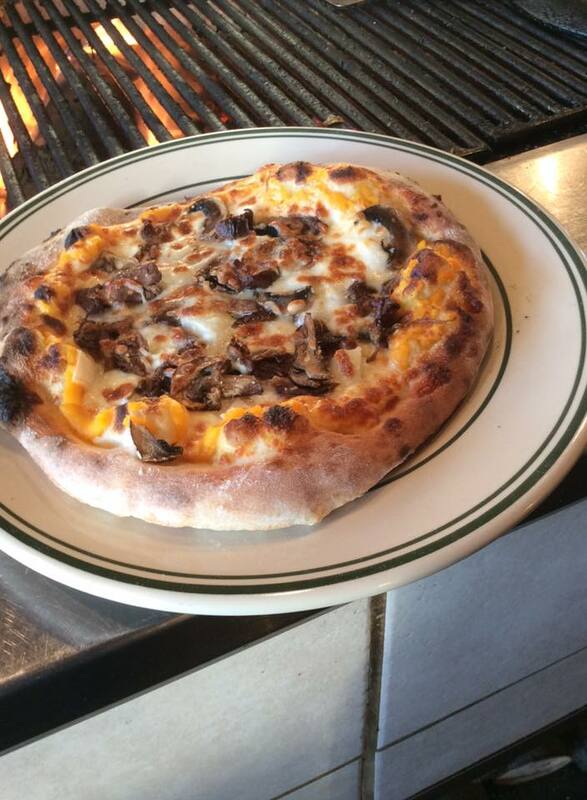 The Napolitano-style pizza is cooked with a wood fire. My husband ordered the Margherita and I the Saucy Sicilian. We were both quite happy. The crust was chewy with perfectly crisp edges. It had the hallmark of a perfect crust for me—the char that comes from cooking near an open flame. The sauce was flavorful; my pizza was saucy as its name implies, while my husband’s had a less liberal dosing as is traditional. There was enough fresh mozzarella to make me happy, too. The sausage was peppery porcine goodness. The Margherita even impressed my Italian foreign exchange student for its similarity to an Italian pie. Signor Gulino is paying a nice homage to his birth country. Delizioso! Known for their craft beer, the Jolly Pumpkin puts out a large array of dishes that compliment a pint of their artisan ale, including my husband’s favorite—the Bison Sloppy Joe. But I like their pizza. Although not in the style of a traditional Italian pizza (the toppings are too plentiful for that), the chef takes the same care as Italian pizza makers do to use great ingredients that make their pies sing. The dough is made fresh daily and baked on a marble slab creating even-cooking throughout its crust. I get the pepperoni pizza. 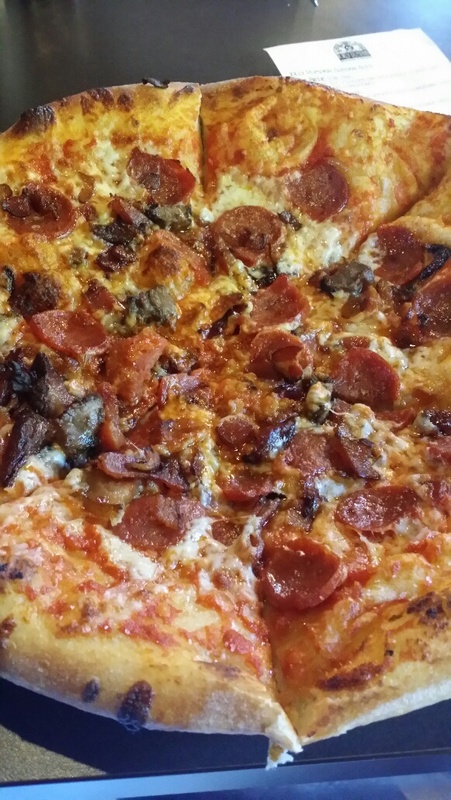 The pie boasts hand-sliced chunky bites of spicy pepperoni , roasted tomato sauce, and plentiful mozzarella. It’s rich and decadent, but completely worth it. It played well with the hard apple cider that I ordered—the tart acidity of the cider contrasted the heavier cheese and sausage. It’s a pizza that I order every time I visit Traverse City. This farm-to-table eatery is known for its focus on seasonal ingredients and local produce and meats. They are not a pizza joint—protein is the star of their ever-changing menu. A thing that doesn’t change though is the ability to order a wood-fired pizza with your choice of various meats, vegetables, sauces, cheeses, and herbs. Besides the traditional tomato-based sauce, you can frequently find Alfredo and barbeque sauces on their menu. Feta and blue cheese provide a different take on the typical mozzarella. I’ve seen meat choices include pulled pork, chicken, and pork belly. If pork belly is being offered, order it. And then get it as a side, because it could make angels sing. Otherwise, choose a few of your favorite ingredients and enjoy your perfectly crisp crust with the flavor that can only come from being cooked with fare. This pizzeria is located at the historic Eastern Market. The huge farmer’s market has been operating in its current location since 1891. 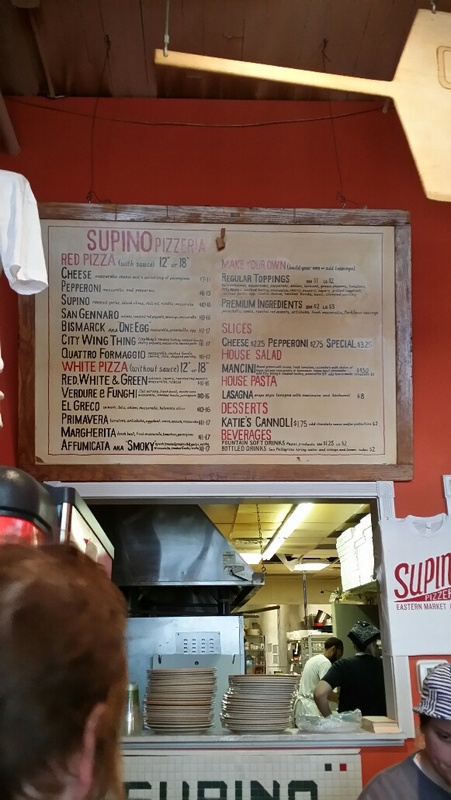 Supino’s is decidedly younger than the market, but they make a sophisticated pizza that warrants a trip to their restaurant. Since they make a pretty-perfect thin crust, show up early on a market day. If you want to be one of the first through the door, you may want to get in line about ten minutes before they open. Many of their ingredients are sourced from Detroit vendors (City Wing’s smoked turkey anyone? ), which makes their red and white pizzas popular with Detroit locals and pure-Michigan loving customers. They have 13 different pizza combinations, but you can choose your own toppings, too. I simply adore a mozzarella and pepperoni from them with fresh herbs. Their prices are incredibly reasonable. Their tasty pizza makes the drive to Detroit worthwhile, while their lower prices make the two-hour trip easier on my wallet.